Update 10th August 2015: In a significant restructuring at Google, Sundar Pichai has been named the new CEO of the technology giant as the company co-founder Larry Page today (10th August'15) announced the formation of a new umbrella firm Alphabet, of which Google will be a part. Larry Page will head the Parent company Alphabet abc.xyz and Sundar will head the Google. Sundar Pichai(born 1967), a technology whiz-kid and an IITian, responsible for the development of the Google browser Chrome as the company's vice president of product development. Now Sundar has been given a big role by Google that is to head Android OS along with the Chrome Browser. Android was earlier headed by Andy Rubin, but due to his sudden resignation Google asked Sundar to head both Chrome and Android. This step of Google seems to be another leap towards emerging Android desktop soon. He is an Indian American Computer engineer. He is currently a vice president of product management at Google Inc.
Sundar Pichai received a B.Tech from the Indian Institute of Technology Kharagpur and was awarded an Institute Silver Medal. He holds an M.S. from Stanford University and an MBA from the Wharton School, where he was named a Siebel Scholar and a Palmer Scholar. 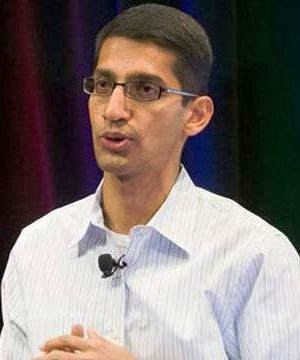 Pichai joined Google in 2004 where he is currently responsible for overall desktop strategy and ensuring access to Google services for desktop users. On November 19, 2009, Pichai gave demonstration of Google Chrome OS. On May 20, 2010 he open-sourced the new video codec VP8 and introduced the new video format WebM to the public.